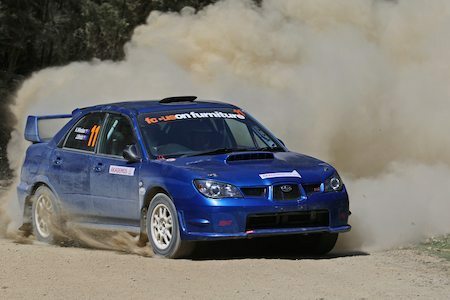 After the recent news of Darren Windus making a comeback to the Australian Rally Championship, comes more good news out of the Windus camp. Arron Windus, Darren’s son, will contest the full Victorian Rally Championship season, in a leased Mitsubishi Evo X. “We had a generous offer which has enabled us to compete in the full season,” Windus said. Windus, who is currently the youngest person ever to win a VRC event, is optimistic about the possible outcomes of the season. Father and son, Darren and Arron Windus, discuss tactics at a rallycross event. “I’m really looking forward to the season. With Dan (Brick) in the navigator’s seat, and a proven car, I think we have the right team together to be competitive. “Overall, the aim is to win the championship,” Windus said. Along with his VRC commitments, Arron will also navigate for his father in his return to the ARC in WA, and possibly taking part in the newly formed ‘DirtRace’ rally format. After a short spell away from the rallying scene, it seems the Windus family is back, and having a real crack in 2019.